Ok. Pi day is coming up this Saturday. Are you ready to celebrate it with some fun activities? Last year I came up with 3 Pi Day Activities for elementary aged children, like making Pi Day Bracelets and making 2 Types of Pi Inspired Artwork! This year I thought it would be a fun challenge to try to introduce Pi Day to my Preschooler. Pi Day celebrates Pi, the mathematical constant that describes the ratio of a circle's circumference to its diameter. Pi's digits stretch infinitely long, never repeat, and seem to be random. I really wanted to share my love for math with my 3 year old. 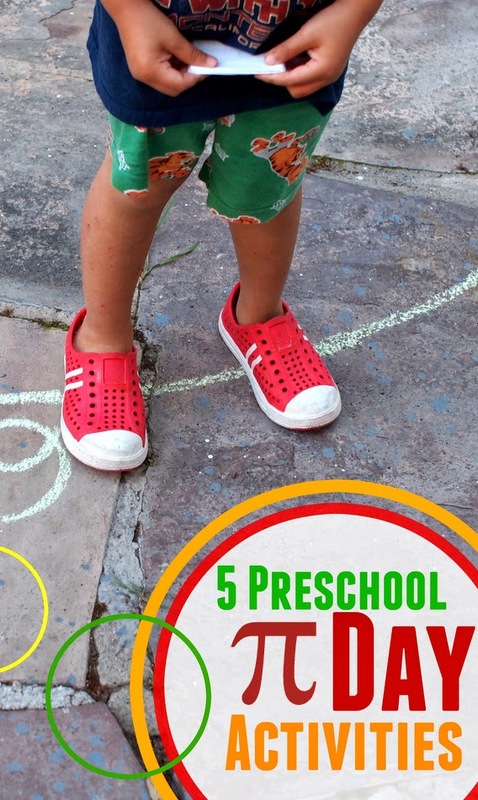 So here are 5 Preschool Pi Day Activities that are fun, easy to set up, and great opportunities for some hands on learning! And here are the 5 ways we'll celebrate Pi day this year! 2. Eat a Pizza Pie! I came up with this activity to really emphasize the digits of Pi and the idea of circumference. First, I wrote out the digits of Pi. Then, I told Chuck that we had a list of numbers (Pi's digits) which he called our "map." We took turns reading the digits to each other as the other one ran around the circle's "edge" to the right number. Then, after we played this game a couple of times, we pulled out our trucks and did the same thing with the trucks. He really loved the idea of using a number "map" to tell us where to go. We really like this song. I included it in our Pi Day Activities because it indirectly relates to Pi. When you hold hands with children, your arms form the circumference of a circle! We didn't do this activity yet, but I totally want to. I saw some great instructions for circle painting at One Inch World. She shares some great tips for painting a collaborative circle painting with preschoolers . So definitely check out her blog for a fun way to combine Pi day with artwork. What do you think? Will you celebrate Pi day this year with your kids?